First look….20. – Dirty wet dog , boats and sailing. It’s a slightly bonkers idea i have that in 20 months time i want to be heading out to sea and over the horizon…..in a boat that i haven’t found yet. The countdown is now 20 months and gone and i can essentially say goodbye to ’19’ (August) anyway because that’s the weeks immediately after my surgery. That means that i really have to crack on and do my best to find the potential boat for the long term cruising project in a very short time frame : in real time just 1 week to go before surgery. While it’s a lot of fun to go kicking around the back row of boatyards the real tool is of course the internet although the risk is not finding the one boat that just has a for sale sign, no broker and not on the net. As it happens i think that most boat owners who are trying to sell their boats are at least a bit internet savvy and even if their boat isn’t with a broker it’s likely to be on a site like Apollo Duck, where my Liberty is once again. So, 20 months to go and lets call this month (July) month 1 because i have already spent hours at the computer going through page after page of boats for sale. I described my basic search parameters in a recent post so i won’t do that again except to say that i did the cruiser-racer around 30 feet a couple of times, then did a pure race boat search and lastly a purely cruising boat search . I’m not quite sure how the site algorythym works because i think i have seen one boat in several searches and some boats only when i have just done an unfiltered search….that one went through more than 20 pages of 50 boats per page and took a very long time. With such a tight budget there were never going to be many potentially viable boats but is was also valuable to see what might be there just outside my budget range…..you never know when an owner is desperate to sell and move on. Sadler 25 which was on the potential boats list until recently, not as nice as in the pictures and just not quite big enough. Ok….i’ll stop teasing and tell you about the actual boat we went to look at. As i have said in a recent post it’s a boat that i know nothing about as it was a race boat from the era just before i started sailing and this style of fin and skeg hull had been completely superseded by much more radical fin and spade rudder designs. Just for reference my first proper race boat was a Hunter Impala, then a couple of half-tonners and then a radical for the time Farr one-tonner and then many years with an OOD34 just after their disastrous time in the ’79’ Fastnet race. This boat precedes all of that. The shape is reminiscent of a Sparkman and Stephens design the She 31 so, wide in the middle and fairly fine in the ends (the boat that is….not my girlfriend) and fairly raw/basic inside, clearly intended for offshore racing without much comfort except decent bunks. The way my search worked out actually gave me several boats of this era and general layout, one of those was a genuine ex racing S&S design but even more race foucussed with a huge array of winches around a large sail handling and access hatch. That one was too far down the old race boat route to easily pull back to a long term cruising boat while the Javelin could potentially become a long term cruising boat. While i am talking about S&S designs this is a famous one ‘Saudade’ which i think is an Admirals cup 2 tonner from the same era as the half-ton Javelin. Anyway and back to the Javelin. From front to back….after a quick look and not an immediate reject we got some lunch and then went back to empty all her gear out and have a serious poke around. First out was at least a dozen sailbags from the forepeak. At least half a dozen genoas, 3 spinnakers, 1 dinghy and an expired liferaft all up there. Forepeak all stripped out, obviously had a sea-toilet in there at some time. Heavy GRP and lots of stringers. The shelf and board structure is non-structural and could come out quickly to make a dedicated stowage area. Centre. Deck-stepped rig and a decent bunk each side. The shroud plates are bonded onto those ply/glass webs, plenty of space to build some dry storage in the middle of the boat. Aft : does my bum look big in this bunk ?……good secure quarter berth each side. Stbd side is difficult to access due to the poor design and build of the chart table. Not really a functional galley, but enough space to build something better. On deck, bow. The pulpit wobbles all over the place, bad design. Looking aft, cockpit is ok. 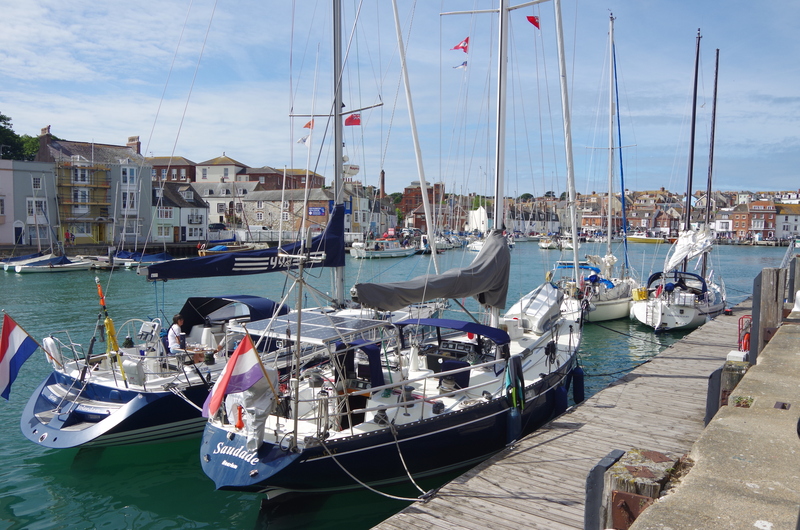 The broker kindly let us have a copy of a recent survey, aside from the hull having quite high moisture levels there were no red flags at all and just a normal set of surveyor reccomendations which the owner has mainly dealt with. The broker had also done his work and had some archive articles about the boat from when it was designed and raced. The general picture is of a successful but not cup winning race boat that then became a capable club level cruiser-racer and then a cruising boat. Some reports suggest that she can be a wet boat…i can imagine that with the long bow overhang and tumblehome. The class is considered to be small inside for the size but that is possibly based around a normal half-ton racing crew of 4 or 5. Brokers pictures capture the lines quite well. Long overhangs and small tucked-up transom. Nice shape, should sail well. Hull is high on moisture but has no visible blistering. Space is useable and ‘good enough’ for long term cruising for the 2 of us. Drying out on legs might not be viable. Needs a lot of detail work to turn her into a cruising home. Next First post : second rule.